Horizon Distance Leads have been CAD engineered for optimum aerodynamics and maximum casting range. The six sided profile prevents rolling which aids rig efficiency while the smoothly tapered weight forward design provides excellent accuracy and stability in flight. 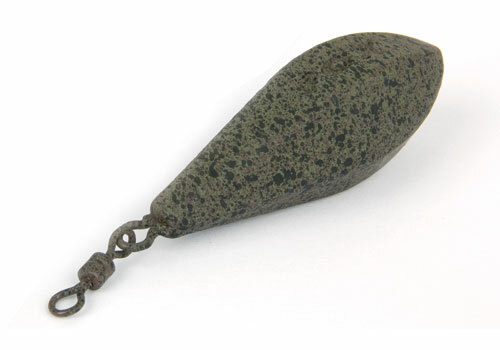 Although primarily designed as a casting lead, the streamlined, tapered shape of the Horizon gives smooth water entry with little disturbance - this makes it ideal in the lighter sizes for use on smaller venues. Each lead is formed with precision injection moulding to provide a unique profile ‘crispness’ and shape consistency throughout the range. Fitted with a unique swivel incorporating an enlarged top eye - this has been specifically designed to ensure the leads work perfectly with all safety clips. If required the swivel can be removed and the lead attached to the clip via the steel loop without requiring further modification. Available in quarter ounce incremental sizes to suit every possible casting scenario and rod test curve. The Horizon Distance Lead is not simply painted but finished in a matt, rubberised non-reflective brown coating, with gravel speckles ensuring it will blend in discreetly with just about bottom.